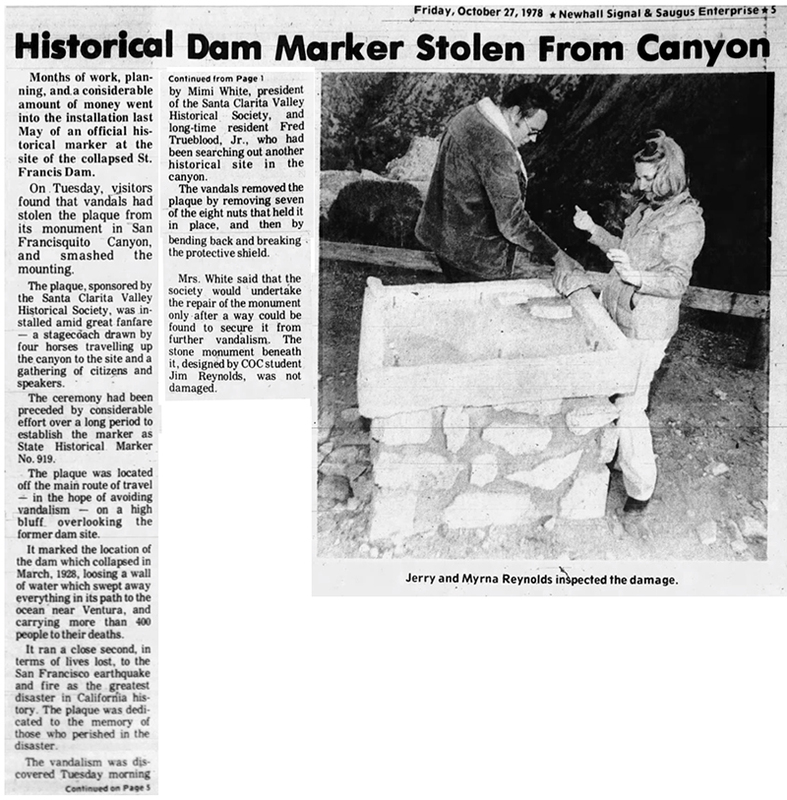 SCVHistory.com | St. Francis Dam Disaster | Historical Society's Dam Marker Placed, Stolen, 1978; State Marker Placed, 1979. The Newhall Signal and Saugus Enterprise | Monday, May 22, 1978. The memory of the wall of water that swept out of San Francisquito Canyon in 1928 still haunts survivors of the St Francis dam disaster. After the San Francisco earthquake of 1906, the St. Francis dam disaster is the worst calamity to strike California, killing more than 400 persons. Many victims were either buried or washed out to sea. The dedication of the dam site yesterday by the Santa Clarita Valley Historical Society as a state landmark brought the events of March 12-13, 1928, into a sharper focus for many survivors. Originally scheduled for the March 12 anniversary date, the dedication was postponed because of torrential rains that made the road impassable. "I haven't been here since 1928," explained Mrs. Lillian Eilers, who was sleeping at the family quarters of Powerhouse 2 several miles downstream when the dam broke. "The emotion of seeing this canyon again today was too much for me. I have been on television and been interviewed about it before, but I just couldn't talk today." Mrs. Eilers managed to pluck her three-year-old son from the water that swept away the powerhouse but lost her husband and two other children. Mrs. Eilers' son is now a mature man of 53, named Dan Curtis. Gazing down at the shattered concrete foundation of the dam, Curtis said he remembered nothing of his father's death. "But I'll never forget that night," said Mrs. Eilers "You try to get away from it, but you can't." Historical Society president Mimi White introduced about a dozen survivors and persons involved in the disaster. Many of the survivors were reluctant to speak before the approximately 150 persons who had gathered on the former west embankment of the dam for the ceremony. "I have no words," said Juanita Ruiz, whose family is buried together near the dam. But one man who played a critical role in the St. Francis dam disaster was not only prepared to speak but relished the role. "I have many true stones to tell. They are embellished but true," quipped Thornton Edwards. Edwards was a Highway Patrol motorcycle officer in 1928, responsible for most of the Santa Paula, Piru, Ojai, and Fillmore area. After receiving warning from a telephone operator who stayed at her switchboard despite the threat of drowning, Edwards mounted his motorcycle and drove through the Ventura County countryside to warn citizens to run for high ground. [Printing error] tales or emotional stress warmed quickly to Edwards' charm. Mrs. White explained about the Historical Society's work in having the site designated California Historical Landmark 919. A work crew from County Fire Station 4 built a stone base for the historical plaque, using fragments of the ruined dam. The plaque which features four pictures and a text, is designed to resist the vandalism many other historical markers suffer from rifle and shotgun blasts. Much of the ceremony had a festive air to it, heightened by the arrival of the plaque in an authentic stagecoach drawn by six horses. "If you want an adventure, try it once in your life,'' joked Historical Society curator Jerry Reynolds, who rode atop the stage along the old Butterfield stage route up San Francisquito Canyon. The Placenta junior high band, under the direction of Andy Downs, played a fanfare for the stagecoach's arrival. Boy Scouts from troop 603, sponsored by the Leona Cox school PTA, paraded the colors and led the visitors in the pledge of allegiance. Captain William Fairchild, commander of the Santa Clarita Valley Sheriff's station, joined Highway Patrol lieutenant John J. O'Brien, Forest Service officer Glen Johnson, and County Fire Chief Clyde Bragdon in representing the different government agencies that work around the dam site. After Jerry Reynolds and Paul Sloan [sic: Sloane] of the Historical Society mounted the plaque, the audience gathered around to exchange greetings and talk to the survivors and heroes. The Newhall Signal and Saugus Enterprise | Friday, October 27, 1978. Months of work, planning, and a considerable amount of money went into the installation last May of an official historical marker at the site of the collapsed St. Francis Dam. On Tuesday, visitors found that vandals had stolen the plaque from its monument in San Francisquito Canyon, and smashed the mounting. The plaque, sponsored by the Santa Clarita Valley Historical Society, was installed amid great fanfare — a stagecoach drawn by four horses travelling up the canyon to the site and a gathering of citizens and speakers. The ceremony had been preceded by considerable effort over a long period to establish the marker as State Historical Marker No. 919. The plaque was located off the mam route of travel — in the hope of avoiding vandalism — on a high bluff overlooking the former dam site. It marked the location of the dam which collapsed in March 1928, loosing a wall of water which swept away everything in its path to the ocean near Ventura and carrying more than 400 people to their deaths. It ran a close second, in terms of lives lost, to the San Francisco earthquake and fire as the greatest disaster in California history. The plaque was dedicated to the memory of those who perished in the disaster. The vandalism was dicovered Tuesday morning by Mimi White, president of the Santa Clarita Valley Historical Society, and long-time resident Fred Trueblood Jr., who had been searching out another historical site in the canyon. The vandals removed the plaque by removing seven of the eight nuts that held it in place, and then by bending back and breaking the protective shield. Mrs. White said that the society would undertake the repair of the monument only after a way could be found to secure it from further vandalism. The stone monument beneath it, designed by COC student Jim Reynolds, was not damaged. The Death Of A Monument. The Newhall Signal and Saugus Enterprise | Friday, June 29, 1979. Initially, it sounded like a good idea to members of the Santa Clarita Valley Historical Society. 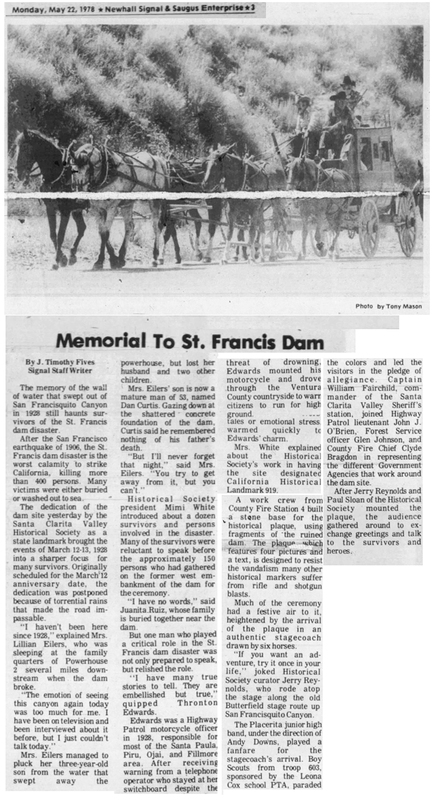 What better way to commemorate the approaching fiftieth anniversary of the St. Francis Dam disaster than to erect a monument to the hundreds of people who died in the ensuing flood when the dam collapsed on March 12, 1928. Working on a limited budget, James Reynolds, the son of historical society member Jerry Reynolds, designed a small plaque in his architecture class at College of the Canyons. The plaque was then built by Paul Sloan. It featured four pictures of the dam, both before and after the disaster, burnt into it. There was also a small memorial on it to the 450 people who lost their lives when the raging flood waters covered over 54 miles of the Santa Clarita Valley in five hours. The plaque was built at a cost of $100 to the historical society. In the meantime, a monument was built out of bits and pieces of the old dam on a site overlooking the crumbling ruins. The plaque would be mounted on the monument during a ceremony marking the fiftieth anniversary of the disaster. The U.S. Forest Service was called in to clear away some of the brush from the area in order to make an observation point where visitors could look down into the valley, the scene of merciless destruction on that fateful March day. They also agreed to build some benches, plant some trees and to keep the area maintained. There was also a second reason for building the monument up high. "Everything in that canyon is shot full of holes," said Jerry Reynolds. 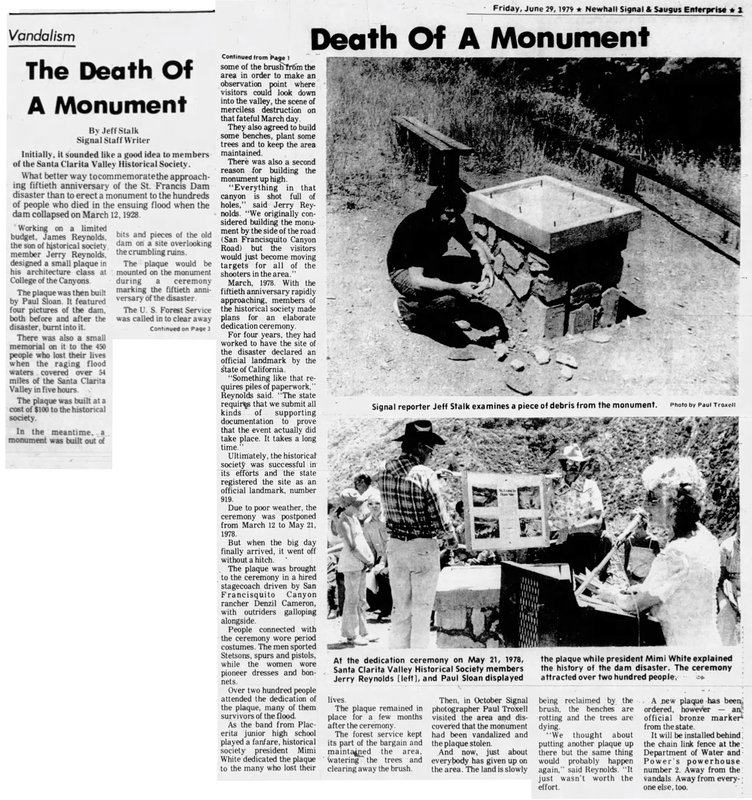 "We originally considered building the monument by the side of the road (San Francisquito Canyon Road), but the visitors would just become moving targets for all of the shooters in the area." March 1978. With the fiftieth anniversary rapidly approaching, members of the historical society made plans for an elaborate dedication ceremony. For four years, they had worked to have the site of the disaster declared an official landmark by the state of California. "Something like that requires piles of paperwork," Reynolds said. "The state requires that we submit all kinds of supporting documentation to prove that the event actually did take place. It takes a long time." Ultimately, the historical society was successful in its efforts, and the state registered the site as an official landmark, number 919. Due to poor weather, the ceremony was postponed from March 12 to May 21, 1978. But when the big day finally arrived, it went off without a hitch. The plaque was brought to the ceremony in a hired stagecoach driven by San Francisquito Canyon rancher Denzil Cameron, with outriders galloping alongside. People connected with the ceremony wore period costumes. The men sported Stetsons, spurs and pistols, while the women wore pioneer dresses and bonnets. Over two hundred people attended the dedication of the plaque, many of them survivors of the flood. As the band from Placerita junior high school played a fanfare, historical society president Mimi White dedicated the plaque to the many who lost their lives. The plaque remained in place for a few months after the ceremony. The forest service kept its part of the bargain and maintained the area, watering the trees and clearing away the brush. Then, in October, Signal photographer Paul Troxell visited the area and discovered that the monument had been vandalized and the plaque stolen. And now, just about everybody has given up on the area. The land is slowly being reclaimed by the brush, the benches are rotting, and the trees are dying. "We thought about putting another plaque up there, but the same thing would probably happen again," said Reynolds "It just wasn't worth the effort." A new plaque has been, ordered, however — an official bronze marker from the state. It will be installed behind the chain link fence at the Department of Water and Power's powerhouse number 2. Away from the vandals. Away from everyone else, too. Historical Marker Gets a Facelift. The Newhall Signal and Saugus Enterprise | Wednesday, November 7, 1979. The third dedication of the St. Francis Dam historical landmark marker, Monday afternoon, was brief, dignified and a little ironic. The new and handsome brass plaque is mounted on a flat vertical side of a four-foot chunk of rock-studded concrete. The chunk is a piece of what was, 52 years ago, a 185-foot high concrete dam, the collapse of which caused the second greatest loss of life (after the San Francisco quake and fire) in California history. It stands inside a powerhouse fence alongside San Francisquito Canyon Road, about six miles north of its intersection with Seco Canvon. The memorial to the dam's collapse was first dedicated at the edge of the dam site on March 12 of last year, the fiftieth anniversary of the St Francis dam disaster. That dedication was done by a tiny group of Santa Clarita Valley Historical Society members, because drenching rains had made a quagmire of the dirt road up to the site and so the public ceremony was postponed. 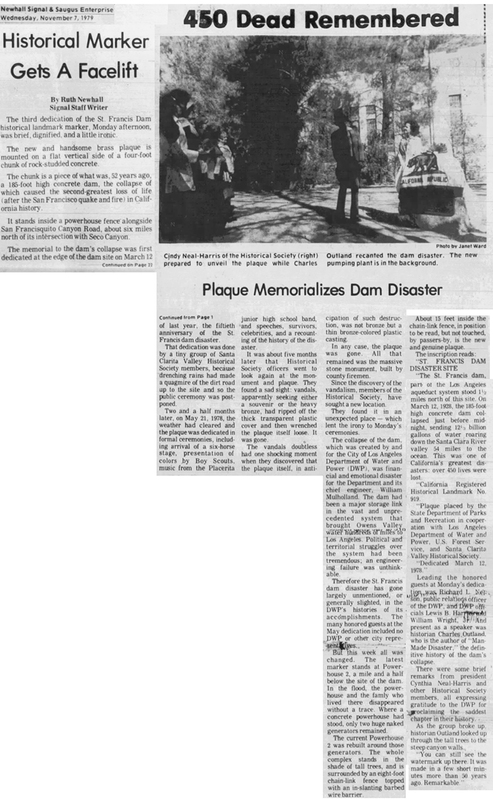 Two and a half months later, on May 21, 1978, the weather had cleared and the plaque was dedicated in formal ceremonies, including arrival of a six-horse stage, presentation of colors by Boy Scouts, music from the Placerita junior high school band, and speeches, survivors, celebrities, and a recounting of the history of the disaster. It was about five months later that Historical Society officers went to look again at the monument and plaque. They found a sad sight: vandals, apparently seeking either a souvenir or the heavy bronze, had ripped off the thick, transparent plastic cover and then wrenched the plaque itself loose. It was gone. The vandals doubtless had one shocking moment when they discovered that the plaque itself, in anticipation of such destruction, was not bronze but a thin bronze-colored plastic casting. In any case, the plaque was gone. All that remained was the massive stone monument, built by county firemen. Since the discovery of the vandalism, members of the Historical Society have sought a new location. They found it in an unexpected place — which lent the irony to Monday's ceremonies. The collapse of the dam, which was created by and for the City of Los Angeles Department of Water and Power (DWP), was financial and emotional disaster for the Department and its chief engineer, William Mulholland. The dam had been a major storage link in the vast and unprecedented system that brought Owens Valley water hundreds of miles to Los Angeles. Political and territorial struggles over the system had been tremendous; an engineering failure was unthinkable. Therefore the St Francis dam disaster has gone largely unmentioned, or generally slighted, in the DWPs histories of its accomplishments. The many honored guests at the May dedication included no DWP or other city representatives. But this week all was changed. The latest marker stands at Powerhouse 2, a mile and a half below the site of the dam. In the flood, the powerhouse and the family who lived there disappeared without a trace. Where a concrete powerhouse had stood, only two huge naked generators remained. The current Powerhouse 2 was rebuilt around those generators. The whole complex stands in the shade of tall trees, and is surrounded by an eight-foot chain-link fence topped with an in-slanting barbed wire barrier. About 15 feet inside the chain link fence, in position to be read, but not touched, by passers-by, is the new and genuine plaque. "The St. Francis dam, part of the Los Angeles aqueduct system, stood 1½ miles north of this site. On March 12, 1928, the 185-foot-high concrete dam collapsed just before midnight, sending 12&frac13; billion gallons of water roaring down the Santa Clara River valley 54 miles to the ocean. This was one of California's greatest disasters: over 450 lives were lost. "California Registered Historical Landmark No. 919. "Plaque placed by the State Department of Parks and Recreation in cooperation with Los Angeles Department of Water and Power, U.S. Forest Service, and Santa Clarita Valley Historical Society. Leading the honored guests at Monday's dedication was Richard L. Nelson, public relations officer of the DWP, and DWP officials Lewis B. [Harrison?] and William Wright J. And present as a speaker was historian Charles Outland who is the author of "Man Made Disaster.,' the definitive history of the dam's collapse. There were some brief remarks from president Cynth'a Neal-Harris and other Historical Society members, all expressing gratitude to the DWP for proclaiming the saddest chapter in their history. As the group broke up historian' Outland looked up through the tall trees to the steep canyon walls. "You can still see the watermark up there. It was made in a few short minutes more than 50 years ago. Remarkable."